England's Ian Bibby produced a strong finish to claim victory in the first professional cycling race to be held on the Isle of Man since 2003. 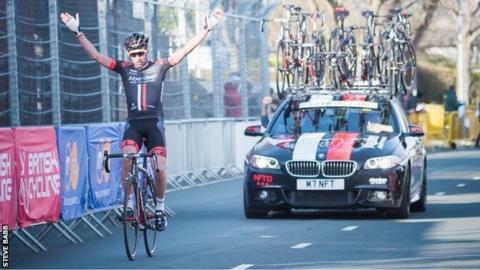 The NFTO racer, 29, claimed a 44-second victory over Erick Rowsell (Madison Genesis) after three gruelling laps of the island's 37.5 mile TT course. Team Sky's Ben Swift finished a further 27 seconds down in third. The inaugural Manx International Grand Prix made up the the second round of the Motorpoint Spring Cup Series. "I'm really happy to get a win," Bibby told British Cycling. "It's a great course with a big climb, which makes it a bit different from a lot of the other ones. Everyone was a bit scared of the climb as it's so hard." The bright and sunny conditions were in contrast to the first round at Chorley, where NFTO's Edmund Bradbury won in the pouring rain. Reigning British men's road champion Peter Kennaugh finished seventh and said it was great to have professional racing back on the island. The Manx racer said: "I've been ill the past couple of weeks and was meant to be in Tenerife on training camp. "I've felt better so decided to give it a go. I'm here to have a good time and enjoy having a race like this on the Isle of Man." Meanwhile, Kimberly Ashton won the two-lap women's race, which is the first round of the women's road race elite series. The Jersey rider (Casp racing) finished one minute and 34 seconds ahead of Nicola Juniper and Elizabeth Stedman. Elsewhere, 17-year-old Matthew Draper won the one lap support race ahead of Rob Sorby and Nick Corlett. Cycling has a rich history on the Isle of Man, with the first Manx International held in 1936, but a professional race has not been held on the island since 2003. Huge crowds turned out to watch the races which, it is hoped, will help the island's bid to host the 2018 British National Championship.